"France is fully committed to ITER"
Geneviève Fioraso, the French Minister of Higher Education and Research, speaks of ITER with passion. In interviews with the media or in addressing her ministerial colleagues, her words are strong and her tone enthusiastic. 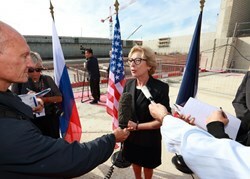 "The huge, amazing amount of work" that is going into ITER impressed her no less last Friday than it did on her first visit to ITER on 17 January 2013, when she came to Saint Paul-lez-Durance to inaugurate the ITER Headquarters building alongside European Commissioner Günther H. Oettinger. She sees ITER for what it is today: "A unique and outstanding project, the broadest international cooperation for research ever implemented." But she also sees beyond, as she stated in an interview to French public TV France 3, asserting that ITER and fusion are "the solution to what I consider the largest challenge of this century—providing energy that is environmentally responsible, that does not generate carbon dioxide like the fossil fuels we are tapping today." The minister also reaffirmed that France, as Host Country, is "fully committed to ITER" and she formally announced to her ministerial colleagues that "France [had] achieved all of its commitments within budget and schedule." Her last words, as she stepped into her car to leave ITER Headquarters, were: "You can be absolutely confident in the support of the French government."